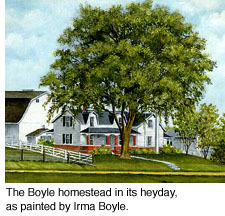 Michael Boyle's Tree focuses on a family with roots in Jackson County, Iowa. Michael Boyle was born in 1820 in County Clare and left Ireland for New York in 1847, at about the same time that repeated failures of Ireland's staple potato crop led to a desperate famine. According to the family saga, he worked with other Irishmen on New York's ship canals, then made his way to the Midwest as a railroad laborer. In 1852 he arrived in Dubuque, Iowa, and in 1853 he bought 160 acres of farmland near a village called Garryowen in Jackson County, Iowa. In 1856 he became a naturalized U.S. citizen, and in the following year he married Ellen Howe  also from County Clare  at St. Dominic's Church at Sinsinawa Mound, Wis. Their first child, Michael, was born soon afterward, and the young family moved onto the farm in 1858. Nine more children were to follow: Mary, Bridget, Ellen, John, Austin, Thomas, James, Rose and Frank. All of them grew to adulthood, which was no mean trick in those days. The farm grew as well: 40 acres here, 40 acres there, another 20 acres and 20 more. Michael Boyle  by some accounts a superstitious illiterate  had succeeded in a new land. Michael died of pneumonia on February 25, 1888, at the age of 67, according to his tombstone at St. Patrick's Church in Garryowen. 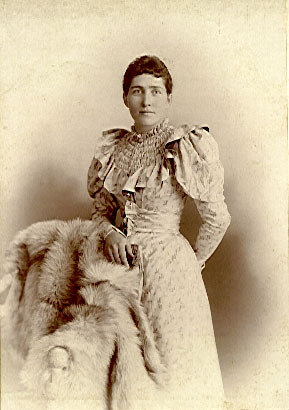 Ellen died two years later of a strep infection on Oct. 11, 1890, at the age of 54 (according to her death certificate) or 57 (according to her tombstone). Austin was called back from Chicago to help John run the property  and eventually they settled with the other children and divided the land between them. John sold off his share in 1915 and went on to work for the railroad. Austin's 200 acres, which he called "Orchard Crest" because of the property's apple orchard, stayed in the family until the 1980s. By that time, Michael Boyle's most enduring legacy  his family  had grown to more than 200 descendants. Where exactly did Michael and Ellen come from? Who were their parents, their brothers and sisters? Ellen was born to John Howe and Ellen Murrihy of Carrowduff in the civil parish of Kilmurry-Ibrickane, in 1832. She was baptized on Dec. 29, 1832, according to Catholic parish records. She had three brothers and a sister: Thomas was born in 1816. Nancy was born in 1818. Charles was born in 1827. John Jr. was most likely born between Nancy and Charles. The 1826 Tithe Applotment Books show John Howe leasing six acres, one rood in Carrowduff (which is Gaelic for "Black Division"). It is known that Ellen Murrihy Howe, Ellen, Thomas, Nancy and Charles all eventually made their way to Iowa. The fate of the two Johns is less clear. There is a John W. Howe listed in the 1854 Iowa census as living in DeWitt, with one male and three females in the household. But it's not known whether this was the father, son or some other Howe. Nancy married Michael Hagerty, most likely in America. 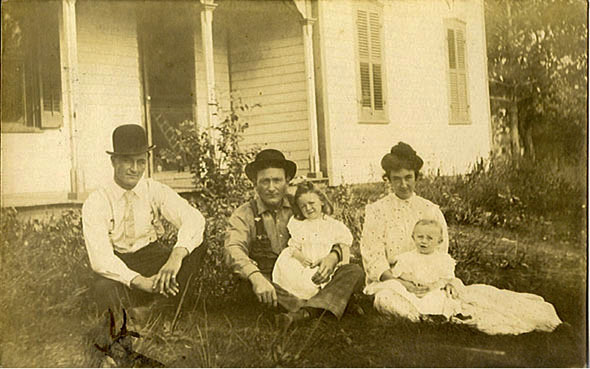 The couple was childless, and by 1900 Nancy was living as a widow in DeWitt. Thomas came to America in about 1850, worked on the railroad and settled in DeWitt in about 1860. He gradually lost his eyesight and had to retire in 1879. He then lived with Nancy, and came to be taken care of by his niece, Ellen Boyle, the daughter of Michael and Ellen (Howe) Boyle. There's no record that Thomas ever married. In 1866, Charles Howe married Mary Murry or Murrihy in DeWitt. Mary was born in 1837 in Miltown, to Martin (Patrick?) Murrihy and Elizabeth Egan. Charles and Mary had several children: The 1880 census lists John, 12; Thomas, 11; Elizabeth, 10; Mary, 8; Patrick, 5. There was also a Charles Howe Jr., who died in infancy in 1874. John eventually settled in Chicago. 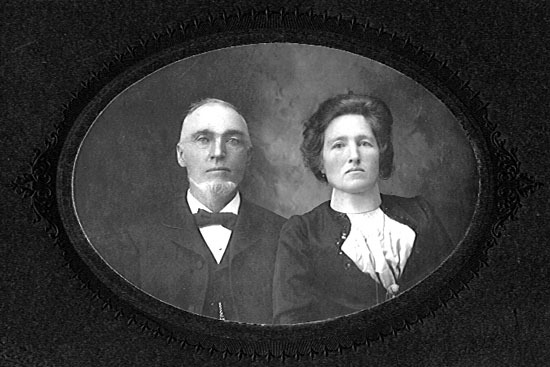 Thomas never married  he lived in DeWitt for his whole life, from 1869 to 1925. Little is known about Elizabeth, but she may have settled in Chicago. Mary married James Gillooly, and there are descendants still living. 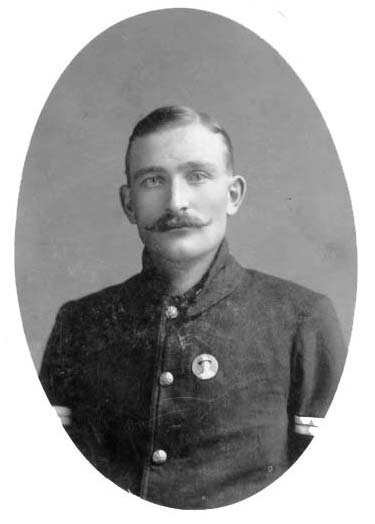 Patrick, born in 1875, committed suicide in 1902. Charles died in 1882, and his wife Mary died in 1924. On Michael's side, there was a concentration of Boyles living in the Quilty/Seafield/Tromra area of West Clare, not far from Miltown Malbay. A number of Boyles there were named John (in the townlands of Rhineroe and Craggane, according to the 1821 list of 40-shilling freeholders), Thomas (in Clounlaheen, according to the same list), Michael (in Seafield, according to parish records) and Austin or Augustine (in Quilty and Seafield, according to a variety of records). All these are names prominent in the Michael Boyle family tree. However, the connection is still tenuous. Internet Family Tree: An extensive record of Michael Boyle's family, presented as hyperlinked Web pages as well as a GEDCOM file. Boyles of Seafield: Could this be a trace of Michael's family back in Ireland? 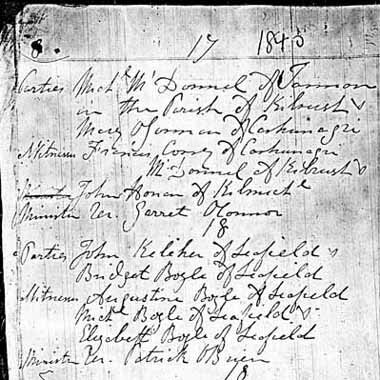 This 1840 entry for the marriage of John Keleher and Elizabeth Boyle, from Kilmurry-Ibrickane parish records in County Clare, also lists Augustine, Michael and Elizabeth Boyle. How Michael Boyle's family lived: Census records and probate records show how farmers lived in the 1880s and 1890s. Michael O'Boyle's obituary in 1888. Ellen Boyle's obituary in 1890. 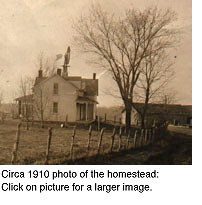 The Boyle Homestead, circa 1910, with commentary by David Boyle. 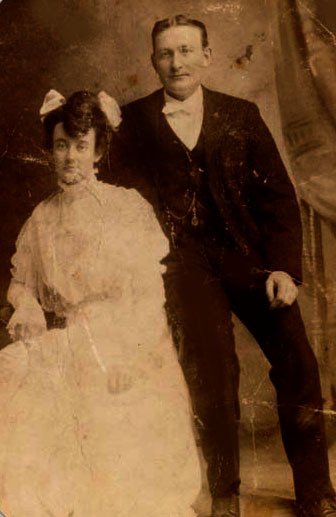 Mary Boyle poses with her husband, Thomas Deluhery, in a photo from 1901 or 1902. Ellen Boyle in a picture probably taken before the turn of the century. 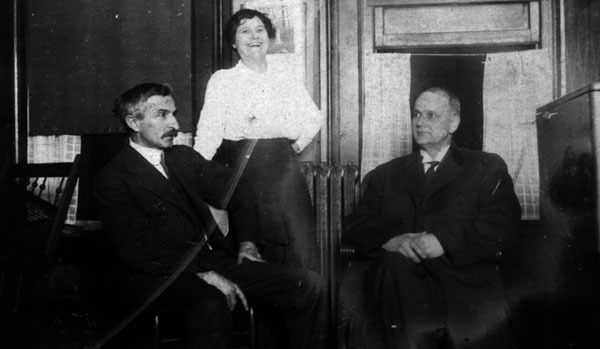 John Boyle with his wife, Mary Barnable, and an unidentified man at right. 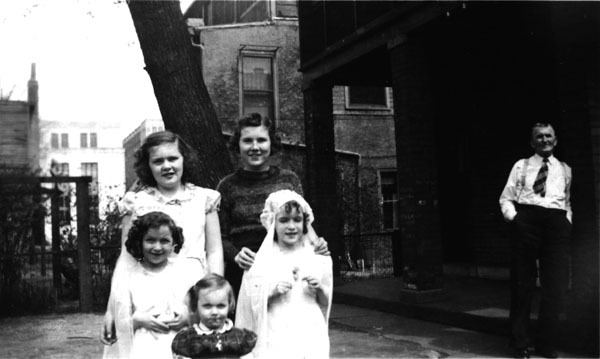 John Boyle in the background, with some of his granddaughters in the foreground, in a circa 1940 photo. 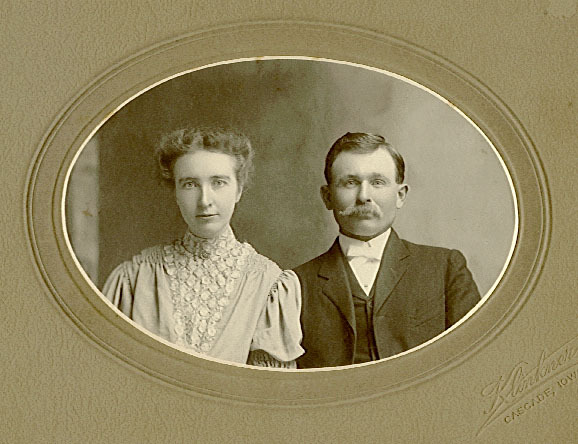 Austin Boyle with his wife, Julia Skahill, probably taken around the time of their 1906 wedding. Austin and Julia Boyle in the 1940s at the "Orchard Crest" homestead, with commentary. Thomas Boyle in a circa 1908 postcard picture, with a ballooning scene as his backdrop. James Boyle in Spanish-American War uniform. James Boyle and wife, Josephine Noonan. 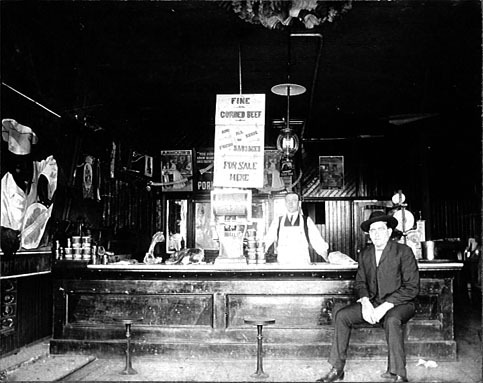 James Boyle is behind the counter of his butcher shop, with brother Frank seated on a stool. James Boyle with family: The man at left is unidentified, but the others are James, Josephine and children Helen and Merlin. 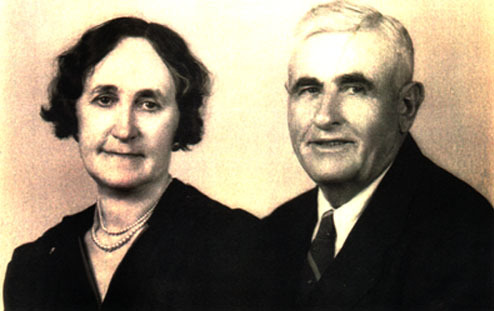 Frank Boyle with his wife, Mae McNally, taken sometime after their wedding. Frank Boyle with family in a photo probably taken sometime in the 1940s. 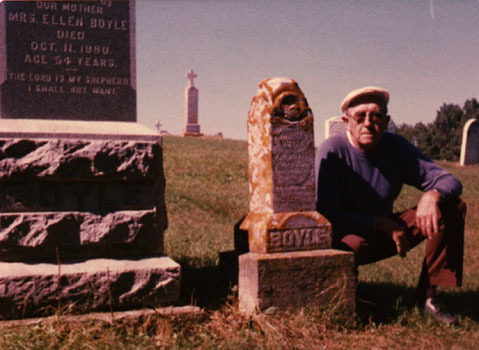 Frank Boyle Jr. at the Garryowen gravesite of Ellen Howe Boyle and Michael Boyle. 'A Family Tree That Spans the Net': An MSNBC story about this quest for family roots.